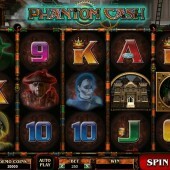 Ghoulish slots always seem to deliver the unearthly goods to the Earth-bound slots punters. 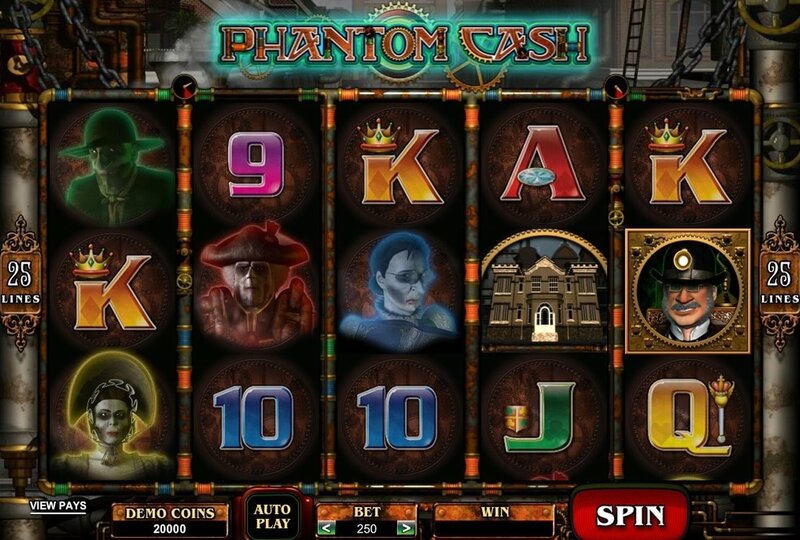 And prolific slot developer Microgaming’s 5 reel, 25 pay-line online slot, Phantom Cash, will have you howling at the moon for more. The reels are filled with some pretty steampunk-looking ghosties, including a top-scoring red ghost Napoleon lookalike (if Napoleon was in an early ‘80s post-punk outfit) and awards 19,000 coins. There are three other ghoulish beauties to look out for, plus the obligatory 9-through-Ace card symbols. The Wilds are actually Victorian ghost-catchers called Thurmingham and Carstairs. (Thurmingham is the younger of the pair and looks like Daniel Day-Lewis, while Carstairs looks like Bob Hoskins in bugger chops.) They substitute for all regular symbols in the game other than the Scatter – although they only appear on reels 1 and 5 respectively - and multiply all winning combos they help form by a factor of 2. The Scatter is the ghostly mansion icon. Five Scatters awards a top whack of 47,500 coins. If that sounds pretty sweet, wait till you see the bonus round. Three or more Scattered mansions anywhere triggers the Ghost Zap Feature. The ghost meter starts at 8 and shows the number of ghosts you need to capture. Our daring duo, Thurmingham and Carstairs will capture all colored ghosts that land in their row to reveal a capture bonus prize of 2x your bet. When both our ghost busting heroes appear on the same row, each captured ghost reveals a bonus prize of 4x the total bet. If you catch a ghost your meter drops down gradually to zero, but you can re-trigger the feature and get more ghosts to catch. Weird takes on the horror genre are nothing new in online slots. Anyone who’s played Microgaming’s wacky horror-themed slot, Halloweenies, or the all-out weirdfest, Alaxe in Wonderland, from the same developer, it seems slots developers have pretensions of being the next Tim Burton of the gaming world. It’s obvious someone at Microgaming has something of a soft spot for the master of Gothic schlock.